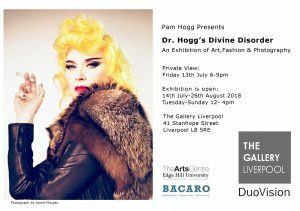 Pam Hogg Presents ‘Dr. Hogg’s Divine Disorder, an exhibition of art, fashion and photography. Britain’s most rebellious designer comes to Liverpool for her first solo exhibition. Her work has changed the traditional concepts of femininity since she began in the early 80s. Fearless, inventive, and provocative are words describing both her distinctive designs and her own iconic persona.